Longtime Cunningham steward Robert Swinston brought his new company to perform at the Joyce this week. 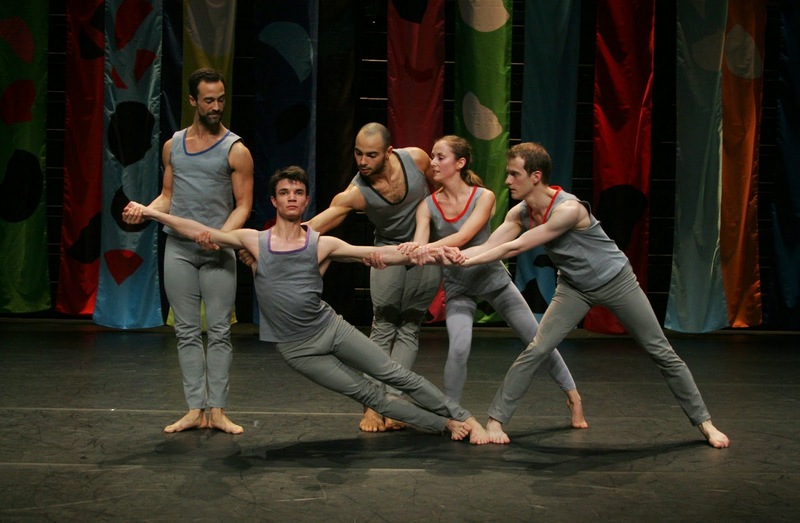 Compagnie CNDC d'Angers, resident company at the Angers Centre National de Danse Contemporaine, is just two years old, but in that time Swinston has developed its eight members into convincing interpreters of the Cunningham legacy. The CCNDCA (okay, so the national structure doesn't exactly produce snappy acronyms) danced an Event on Tuesday night. It was brave to begin with this seamless 75 minute work, which is a concatenation of excerpts from potentially 11 of Cunningham's dances. The first and most striking element is the set, comprising multi-colored banners with cut-out shapes, evoking Matisse and in fact done by his granddaughter, Jackie. I suppose if anyone has the right to further Henri's legacy in a direct manner, it would be a literal legacy. Fans blow the banners dreamily; lighting (by Augustin Sauldubois) at times glows from behind them. The combined effect is akin to wind and sun, appropriate for the nature evoked in Cunningham's oeuvre. These effects are yet furthered in the score, played live, by John King and Gelsey Bell—chirrups, tones, yelps, and sundry other sounds painted an organic sonic setting. The movement was a familiar, welcome tonic—crisply delineated, muscular, turned out, infinitely extended, architectural. Dancers lean on or are supported by others, at times with the unconscious fraternity of children, at others with groupthink lifts. Cunningham's style combines a sense of freedom with great underlying structure. It takes tremendous training, however, to interpret it with an easeful demeanor, and these dancers largely succeed in that. At times, it felt as if some added force was required, and in some of the men, more personal interpretation than demanded. I was particularly moved by Clara Freschel, luminous and clear-sighted, and Flora Rogeboz, with polished lines and a tremendous expansiveness. The company's existence is surely a gift, and even though we may ultimately see it perform here nearly as often as the old Cunningham troupe, it's sad that they are not based in the US. But as the world shrinks and borders melt, so does the field of dance, to our benefit. The company is dancing a second, shorter Event this week as well.